For Everyone Only: Back! Me. I'm back. On ma blog. Back! Me. I'm back. On ma blog. Hello Blog-land! I've decided to announce my return to this place, perhaps to make it a little happier of a space to stumble across on the inter-web. I thought, what better way to do this then to remember and share a little bit from my trip to France this past summer? And then we'll take it from there. We will indeed, TAKE IT FROM THERE. 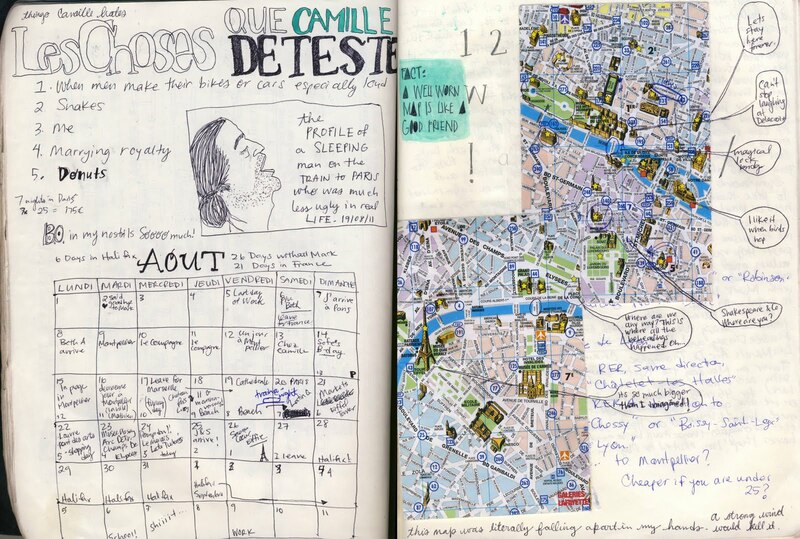 Here is, in no particular order, a spread from my journal that I kept and wrote in and taped in (my favorite) whilst trouncing about the countryside, sleeping on trains, sleeping in parks, sleeping in cafés, playing crib and seeing beautiful sights. Maybe I will sprinkle in a photo or two as well. YAY. Without any further adieu, the first couple pages for your viewing pleasure. dang girl. that's tiny. that's what you're thinking. right? JUST CLICK THAT! just click it. On the left is a comprehensive list of 'The Things Camille Hates' (written in French, because I'm awesome) you'll notice that I am number three on this list, but that's just how we joke okay? You shouldn't be worried about it. Also, just in case you didn't know, Camille is who we visited in the south. She is a lovely girl, who evidently, would hate to marry royalty. Anyways. School is calling, so I'll end it there! France Journal Part II: For the love of tape.